Josh Wilson leads chorale at Newark Liberty Airport on Sunday. A traveling guitarist is becoming viral sensation after leading a group of passengers in a rousing round of the Beatles' classic "Hey Jude" while stuck at Newark airport over the weekend. 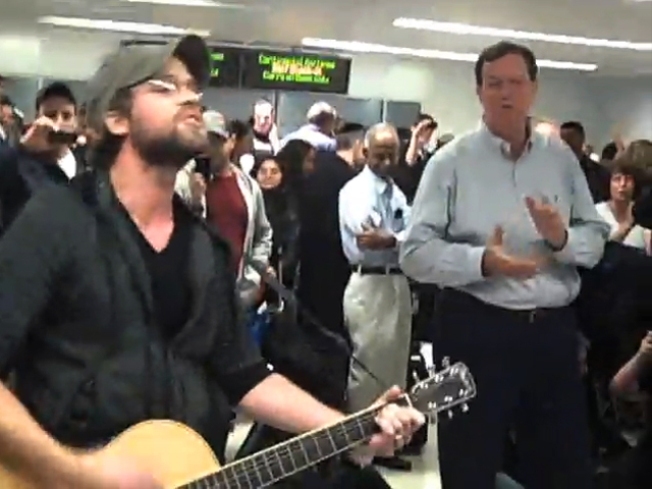 GuitaristJosh Wilson posted the video on his YouTube channel following the security debacle at Newark Liberty when a security breach caused Terminal C to be shut down for over six hours. Wilson leads the group of dozens of tourists, families and even some disinterested onlookers through the song, giving prompts through he verses and getting more clapping and encouragement during the chorus. A second video from a different angle was posted by a friend of Wilson's who wrote: "Josh just couldn't take it anymore and broke into song. A few shaky moments but the "Na Na's" saved him. Powerful Catharsis but the line was unmoved. We're still just sitting here an hour later. Going to South Asia today? Doubt it." The delay was caused on Sunday when someone picking up a passenger told an officer guarding the exit that he thought he saw a man enter through the doors Sunday, TSA officials said. TSA reviewed surveillance video before sweeping the airport, she said. The video confirmed the man had entered through the exit, and officials made passengers leave the terminal and be rescreened, which caused massive delays. Authorities found nothing suspicious when they searched the terminal after evacuating passengers. They are still trying to determine the man's identity. Terminal C, where the security breach occurred, is used mostly by Continental Airlines. Wilson did not return a request for comment -- hopefully he finally made it to South Asia.